1) Which regulations & directives do apply to the design and construction of our range of products for electric heating? 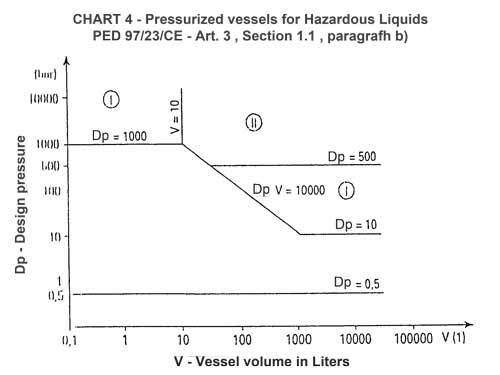 2) What does discipline the ATEX Directive 94/9/EC? 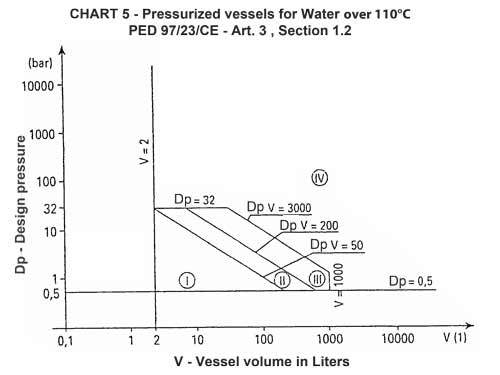 3) What does discipline the PED Directive 97/23/EC “Pressure equipment” for electrical application? As in the chemical and petrochemical, industrial processes, oil platforms and on many military installations materials which are stored, processed or produced in areas where the atmosphere is potentially explosive and wherever explosion-proof heating elements are needed, from July 2003 all such equipments and parts put into service within the European Community must obligatorily respect mandatory Atex 94/9/CE. All our equipment and products for explosion-proof facilities are certified according to the ATEX Directive 94/9/EC. An explosive atmosphere is defined as a mixture of flammable substances in the form of gases, vapors, mists or dusts which being in contact with air or if exposed to atmospheric conditions, after ignition, have a combustion which spreads to the entire unburned mixture. 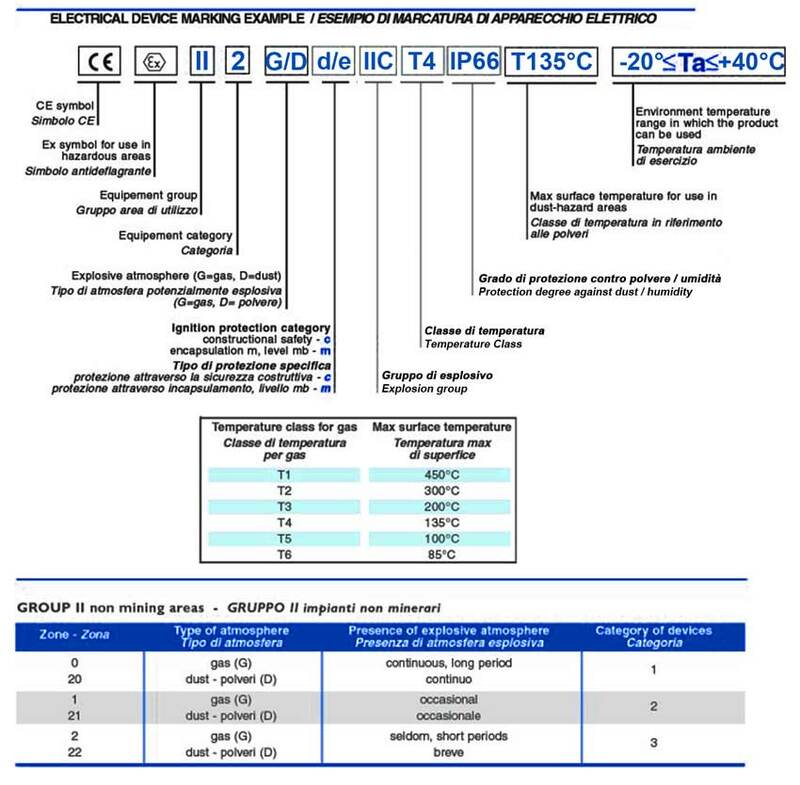 With the ATEX Directive 94/9/EC, European Community requires that all electrical equipment to be installed in weather conditions with temperatures between -20 ° C to +40 ° C and pressure in the range 0.8 bar / 1.1 bar must necessarily be designed and constructed so that their energy output does not produce an explosion, or at least that this is kept under control. 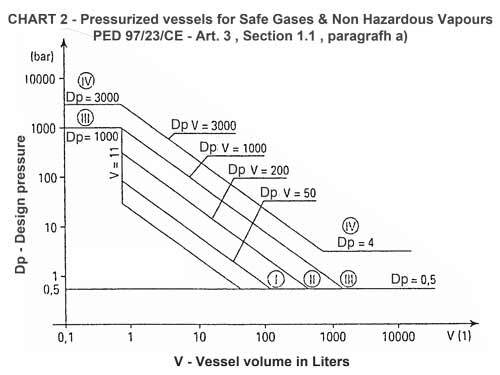 Therefore, the user of such Explosion-proof equipments and devices must proactively prevent an explosion risk assessment, keeping in good account the probability of occurrence of such atmospheres, along with the degree of danger, the presence of energy sources, processes and its interactions, the installation of equipment and possible consequences. 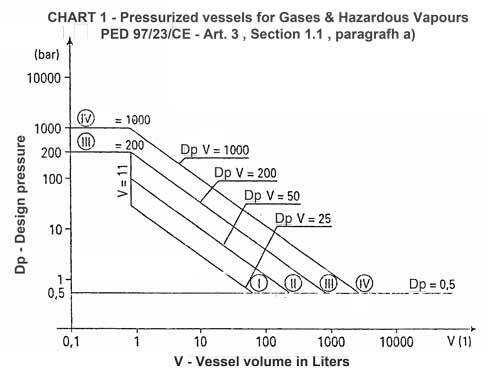 1) To prevent the formation of potentially explosive atmospheres. 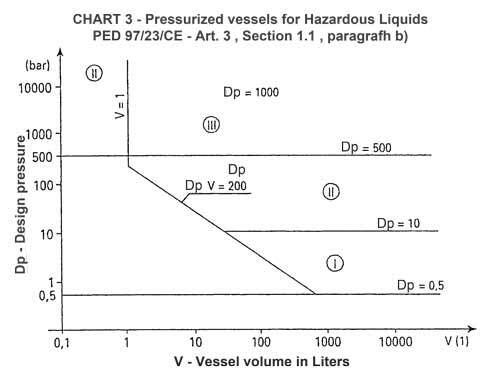 2) If it is impossible what concerns the point 1, the user must prevent the ignition of the explosive mixture. 3) If it is impossible what concerns the point 2, then the user must at least reduce the explosion effects, so that the risk is removed. 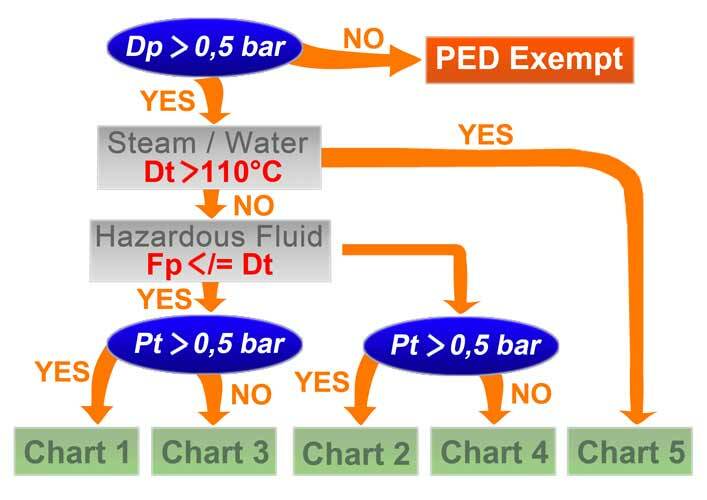 During the design and manufacturing of any kind of pressure equipment for electrical heaters like process heaters, electric heat exchangers and/or industrial continuous heaters, either for Safe-Area or Hazardous-Area Installation, European Community ‘CE’ does oblige all manufactures of Ex-proof equipments strictly to compulsorily respect the PED Directive 97/23/CE. All our pressurized heating equipments are manufactured in compliance to PED Directive 97/23/CE.